Why are federal Interstate projects on the T-SPLOST list? Why are any I-75 interchange projects on the final T-SPLOST list? Especially now that Congress finally got around to passing a transportation bill? 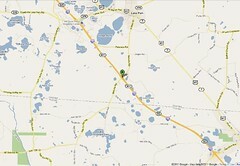 I-75 is a federal highway; shouldn't it be paid for with federal tax dollars, not $31.5 million of "local" sales taxes? 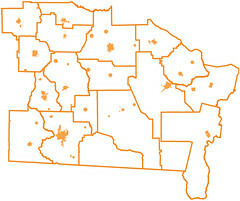 About the transportation act, and then three T-SPLOST I-75 projects. Richard Simon reported for the Sacramento Bee 29 June 2012, Congress passes transportation bill, halts student loan rate increase. Jamie Dupree's Washington Insider had some more detail in the AJC 28 June 2012, Congress moves highway, student loan bills. Here's the actual H.R.4348 -- MAP-21 (Enrolled Bill [Final as Passed Both House and Senate] - ENR). Those are just the T-SPLOST dollar amounts; not the total costs of those two projects. A third project, for exits 22 and 29, got moved to TIP money, which is federal money. Why didn't these two also get moved to TIP and off of the T-SPLOST list? Finally, here are the details for each of those projects, extracted from the final report for exits 2 and 11, and from the unconstrained list for exits 22 and 29. Why are the remaining two not like the one that got moved to federal funding? I attended the transportation plan open house on the day that anyone could come from early morning until 7:00 PM and when I went at 5, I was only the sixth person who had been there all day. Corey Hull showed me and four other people the plan, answered our questions, explained the difference between this long term plan and the TSPLOST and there was a discussion about how one might go about becoming a bus services provider in the area. The amount of money allocated to the city of Valdosta for transportation is not an amount that is near what a bus system would cost, so there still will have to be other funds available to make that possible. Even though our group brought the attendance for the day up to 10 citizens, it was a huge improvement over the last open house, when NO ONE showed. Corey Hull was very helpful and had a lot of information that probably would have been fascinating to others if they had attended, but once again there was virtually no input. 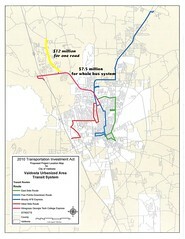 According to projects submitted for T-SPLOST, a bus system would cost about $7.5 million (startup and a few years run-time), but that got cut first pass, while $12 million for widening one road is still in the T-SPLOST list. I'm told that public transportation is not an issue around here. If people think it is, maybe they should show up at meetings like the one SGRC organized about the other transportation plan and say they want a bus system. 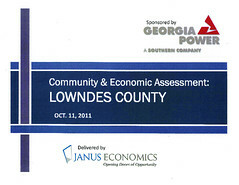 The South Georgia Regional Commission held a public hearing on Wednesday June 6th to give an overview of the current Implementation Phase draft of the Joint Land Use Study (JLUS) for Moody Air Force Base and surrounding communities. 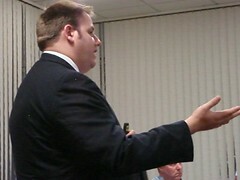 Todd Miller, the project coordinator, gave a power point presentation. When asked if the presentation could be made available on the SGRC web site, he said yes (and then called to make sure I could find it). The complete draft implementation phase documents are available at http://www.sgrc.us/JLUS/implementation.htm and the comment period is open until the end of June. Comments should be sent to Todd Miller at tmiller (at) sgrc.us. Valdosta, Lowndes County, Georgia, Fri, 8 Jun 2012 10:21:39 -0400. I've put a copy on the LAKE website here. It will be interesting to see what projects local governments submit. Maybe you'd like to suggest something to them. Hm, looks like there's plenty of discretionary funds for a bus system such as is recommended by the Industrial Authority's Community Assessment. Corey Hull says they're almost full. However, the presentation is already on the SGRC web pages. The City of Valdosta will be videoing the event. Once Corey knows when it will be televised on the City's TV channel, SGRC will advertise that. There's also some unknown level of possibility that the videos may be made available on the web. I am sorry about the confusion this has caused. This corrects the earlier post. The corrected spreadsheet he sent is on the LAKE website in Excel spreadsheet and HTML versions. In the HTML version, I have added three columns. Name is taken from the Unconstrained Project Listing. Difference and Diff% were computed from the Original total Cost Estimate and the Updated Total Cost Estimate. The project descriptions may be found in the unconstrained and constrained project lists. More later. Received yesterday from Corey Hull, with this cover sheet message, responding to my request in the T-SPLOST public meeting Monday. In the attached spreadsheet you will find the each project associated with four columns: the original estimate, the updated estimate, the TIA funding (any difference from the TIA and updated cost estimate is a secondary funding source i.e. federal, state, or local), and whether that project is currently included in the constrained list. 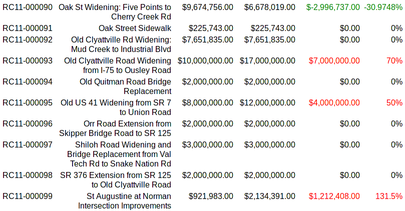 GDOT provided the updated costs estimates (based on current GDOT bids) and in some cases those estimates were further revised by GDOT and the local governments where appropriate. All project scopes remained the same with the exception of RC11-000049 and RC11-000042 (highlighted in yellow), these project termini were changed significantly. I hope this answers your questions, let me know if you have any more. The spreadsheet he sent is on the LAKE website in Excel spreadsheet and HTML versions. If you want to know what the projects are, you need to look at the unconstrained and constrained project lists. More later. The SGRC website has been updated to correct the error for the public comment form. Thank you for letting us know and helping to spread the word about these public meetings. Comments are being accepted by email at chull@sgrc.us, by fax at 229-333-5212, or by mailing them to SGRC, ATTN: SG RTR, 327 W Savannah Ave., Valdosta, GA 31601. For more information please call Corey Hull at 229-333-5277.